Any time you see the + sign I will have new content in it. I hope this helps. 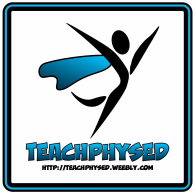 During the school year I will post one TeachPhysEd video and one Let's Dance Video per week. You will notice I offer a lot of content for free. From files to videos. If you enjoy these resources, would please support me (and my family) by purchasing something from my Teachers Pay Teachers store. Most items are less then the price of a Starbucks coffee and the file is yours for life. It would really help me out. If you are like me you love to teach your students about sport stacking. I created this Google Slide for anyone who would like to use it. On the presentation are graphics and the animated GIFs from my TPT store I made years ago. By clicking the link you should be asked to make a copy to your Google Drive, that way my copy can stay the way I like it. I have recently started putting my lesson plans up for sale in my TPT store. The lesson plans go along with the TeachPhysEd videos I post for free on my YouTube channel. Instead of taking notes during the video you can purchase the already laid out lesson plan. The objectives of the lessons are already written out and can be used to post as learning targets for the students. I also include diagrams of how to setup the activity along with what it would look like with the students playing. The diagrams are similar to my various eBooks in my store. I also give some modification ideas in case you do not have the equipment needed for the activity. There is a link in the file that will take you directly to this lesson’s YouTube explanation video as well for another great visual. My eBooks are currently avaliable in my TPT store along with a lot of other items. Most of the activities in the eBooks are not posted on my YouTube channel. If you love the activities I currently share for free, please take a look at the different eBooks I have to offer. Would You Rather cards are really cool and the students love using them in class. The cards allow the students to choose an activity they feel comfortable performing. Each activity as a QR code linking to an animated GIF of how to perform it. I have 3 different sets for sale plus a bundle to purchase all 3!